1. When it's not running, don't show the name of a task (just have the clock). 2. Maybe an option to switch to the dark background when it's running. Mainly the first. Right now I glance at the menubar and think it's going when it's not--even though I do have the spinning clock set--but in this case that means I'd have to notice the absence of something, which is much harder than noticing that something is happening. I’m currently thinking what to do about this. Could you post a screenshot of your Timelime Preference panel (Menu Bar tab), so I can see exactly what setting you have made. Anyway, I will add an option in the preferences that allows you to only show the task name when the timer is running. one when it is. That would certainly shout it out. indication that it's not running. 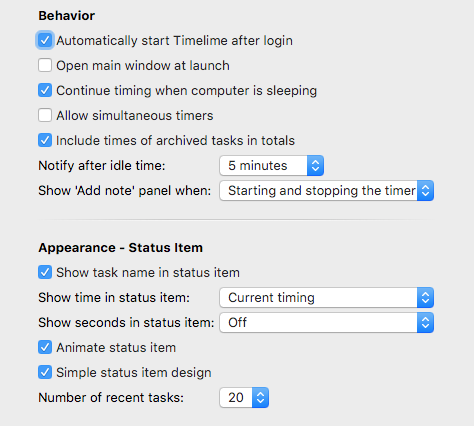 I have now added an option in Timelime’s preferences named “Minimize status item when timer is not running”. Now, if you have “Show task name in status item” and/or “Show time in status item” enabled, it will just show the clock symbol when no timer is running. Apart from that, if you want a more clear indicator wether the timer is running or not, you can set the “Show time in status item” setting to “Current timing”, then the status item will show “— —“ when the timer is not running.